A Danube river cruise may be just what you are looking for your holiday. On the other hand, a Rhine river cruise does not sound that bad either, right? 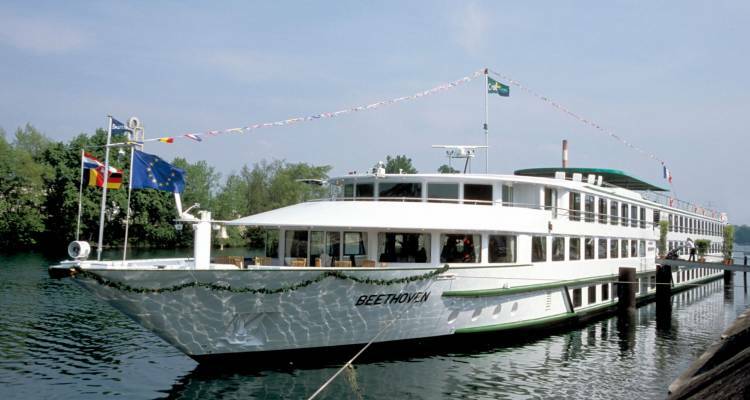 CroisiEurope Travel’s, MS Beethoven, the four-star ship, will take you to places! Built in 2004, but refurbished in 2010, it now offers 90 cabins which can host up to 180 guests. This luxurious ship measuring 110 m in length and 11.4 m in width, stretches along 3 decks from which anyone can marvel at the breathtaking landscapes. Those who prefer staying indoors, admiring the view from one of the French balconies is a tempting idea, too! A lounge bar designed in an appealing color palette to which 180-degree panoramic windows have been added. A gift shop filled with a vast variety of souvenirs. Occasional music ensured by local performers, games and quizzes. Upper Deck - 42 cabins - 40 twins and 2 cabins with double beds. Middle Deck - 27 cabins - 24 twins, 2 cabins with a double bed and 1 cabin for disabled passengers. Lower Deck - 21 cabins - 19 twins and 2 doubles. The MS Beethoven cruise ship has 90 cabins to offer to its visitors, out of which 6 are equipped with double beds and 1 has all the equipment needed for the disabled. The cabins on the Upper deck feature mesmerizing French balconies which will add an extra amount of magic to the trip.